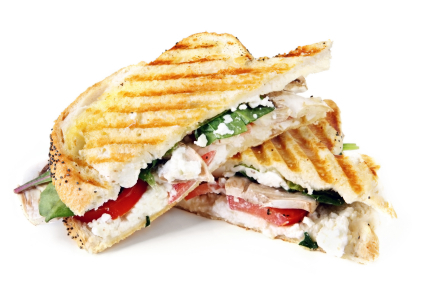 Grilled Goat Cheese Sandwich! MMMMM! I am obsessed with goat cheese. I can’t get enough of it lately! Salads, pastas, bagelwiches, all made better by goat cheese. My other current love is arugula, so peppery and nutritious! So imagine my delight when I discovered a way to combine my two new favorite things with the absolute best comfort meal- a grilled cheese sandwich! 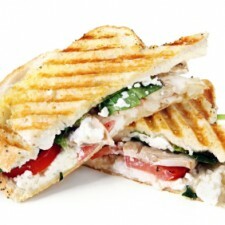 Popular office food here at Kelapo, grilled cheese sandwiches can be easily made on a Panini maker in the break room. They also make great happy hour nibbles when cut into little pieces. Spread the goat cheese on one slice of bread. Sprinkle with chopped fresh thyme and arugula, then add sliced mushrooms and tomatoes. Top with the second slice of bread. Heat a skillet (or panini-maker) over medium-low heat. Spread coconut oil on the outsides of the sandwich. Place the sandwich on the heated skillet (start with the side with the goat cheese on the bread). Press the sandwich with a spatula and cook until golden. Turn the sandwich, press with the spatula and cook until the second side is golden. Serve immediately. Check out our video for a Smoked Pear Grilled Cheese!